While standing in a Tuscan vineyard full of ripened purple fruit to stretch my legs during a long car ride from Pisa to Rome, I found myself captivated by a vision that appeared straight out of a Brothers Grimm storybook. 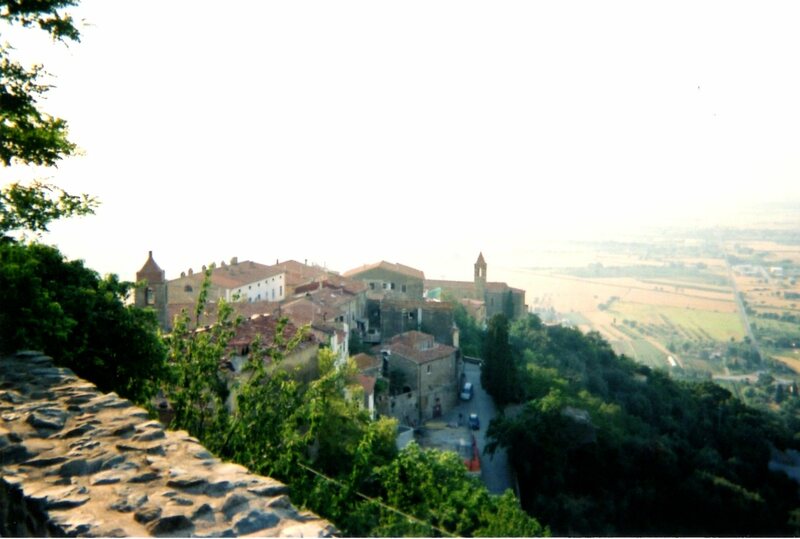 Sitting high above me in a fairytale setting was the castle village of Scarlino. Located only 62 miles SW of Florence and a short way inland from the coast, Scarlino looked like an island floating on a sea of green trees. Blocky beige houses tumbled down the hillside, hemmed in by ancient stone walls and oak-filled forests. Small medieval hilltop hamlets have always had a magical effect on me. They leave me curious and compelled to see more, as if they held a secret ready to be discovered. Scarlino was no exception, and I quickly decided take a temporary detour to the top. After driving up a few switchbacks, I rolled my little car through the old medieval gateway and into the quiet village. Narrow cobbled streets took me to rustic corners, tiny piazzas and tall brick buildings. Bits of the 11th century fortress walls, great for a perch, provided expansive views of the surrounding countryside. To the west, the Mediterranean shimmered endlessly toward the horizon. Located only twelve miles from the coast, Scarlino (scherl in the Lombard tongue, meaning lookout-post) offered a perfect opportunity to experience Tuscany without the waves of tourists. Vines and flowers grew around crumbling rock in crisscross formation and stonework felt warm to touch. I passed by several coffee bars, restaurants, and tiny food shops. Small gatherings of locals sat about the piazzas engaged in conversation. While relishing the expansive view from the wall, an elderly gentleman in dark worn slacks and a white t-shirt approached me for a visit. In a town where very few speak English, typical of small villages like this, our language limitations were no barrier. His wink and broad toothy smile gave me reassurance that I had made a friend. 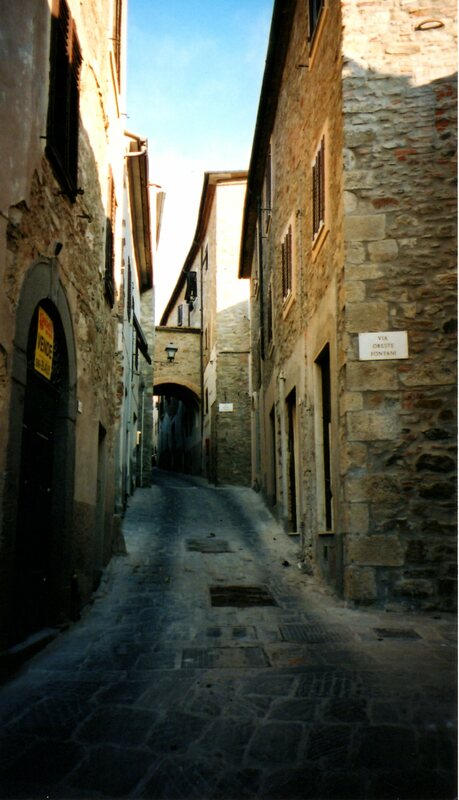 Scarlino is a maze of Medieval streets. My short stroll through the village provided some authentic Italian nooks and crannies that are so enjoyable to stumble across. Below is the backside of a restaurant that, on the other side, offered birds eye views of the valley below from a flagstone terrace. Bright red geraniums light up this old crumbling wall. Afterwards, I found a chance to look up the history of Scarlino on my laptop. My strong attachment to a place always involves the past and I love to investigate. What I found is that archaeologists have discovered remains of a small village where Scarlino is today, composed of wooden huts surrounded by a boundary wall dating from the Late Bronze Age (10th – 12th century BC). Since then, communities have come and gone, including Etruscan settlements, until the early medieval ages when Scarlino became an established village with a castle fortress. 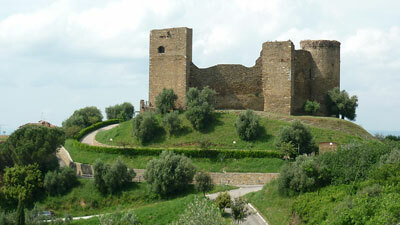 Rocca Aldobrandeschi, its ancient castle, is worthy of exploring. Although much of it is no longer existing, the ancient grounds, towers and views fascinated me. According to documentation, it was in existence by 973 AD. and was once a stronghold for the northern city of Pisa. 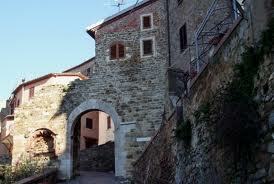 Originally owned by the powerful Aldobrandeschi family, the village and castle were conquered by Pisa in 1164. During this time, political and military expansion dominated the goals of the wealthy and prestigious. By the 13th century, Pisa had permanently imposed its authority along the nearby Tyrrhenian coastline. Curiously built with five sides and three odd-shaped towers, the castle is strategically positioned overlooking the valley on one side and the coast on the other. A wide panorama of patchwork fields in variegated green surrounded the village from below. Opposite, rolling hills of oak give way to the distant open expanse of the Mediterranean sea. Today the castle is used for local shows and cultural events. Susan, these pictures are breathtaking. How wonderful that the castle is being used for cultural events. Communities are wise to preserve and utilize such beautiful buildings. 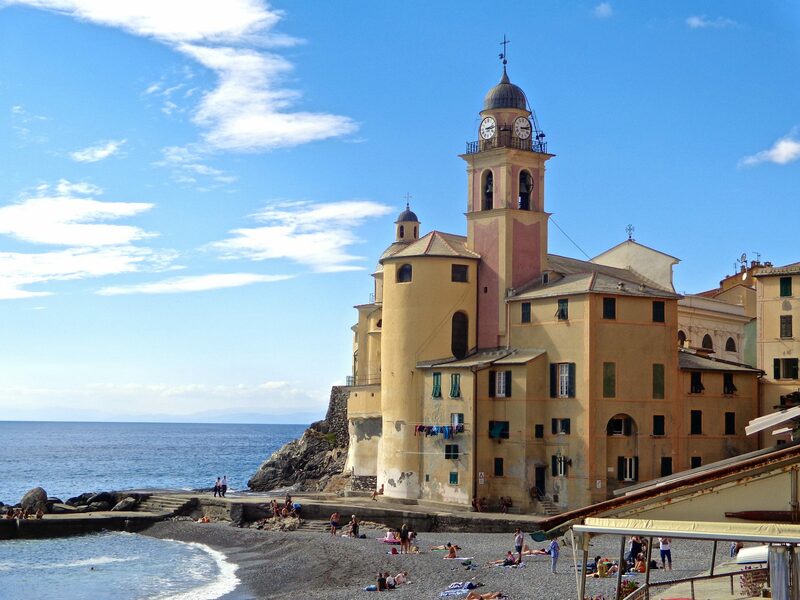 Thank you – Scarlino is now on the bucket list! My pleasure…I hope you do go! what a beautiful “paesino” ! 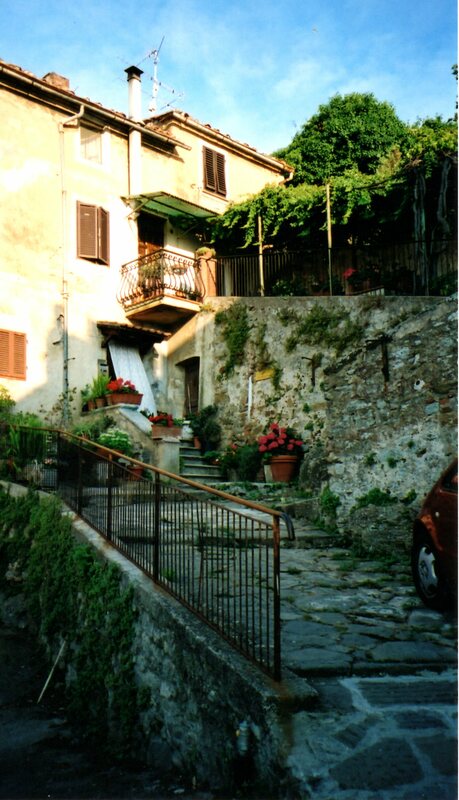 Thank you Susan….I have a friend who was JUST asking for some Tuscan hillside town ideas for vaca…I will certainly forward your post to here! Lovely pics!